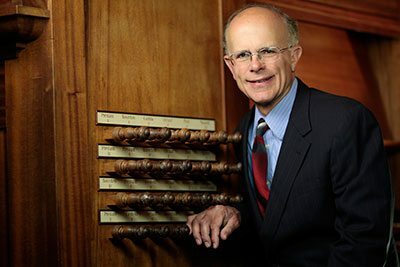 Wilson, one of America’s leading concert organists, has been Trinity’s organist and artist-in-residence since late 2009. A native Ohioan, he was director of music and organist at The Church of the Covenant in Cleveland for nineteen years, and continues as head of the organ department at the Cleveland Institute of Music. Having grown up in the men and boys choir of Trinity Church in Toledo, the choirs and music of the Anglican tradition have been an influential part of Wilson’s musical life. During graduate school, he served as organist and choirmaster at Calvary Episcopal Church in Cincinnati, Ohio. During 1978-79 he served as a visiting assistant in music at Canterbury Cathedral in England under Dr. Allan Wicks. At the Episcopal Cathedral of the Incarnation on Long Island, Wilson directed one of the longest-running choirs of men and boys in continuous existence in the United States. He frequently presents workshops on Anglican choral and organ music, and on service playing. He has been organ clinician at the Evergreen Episcopal Church Musicians Conference, the Montreat Conference on Worship and Music, the Interlochen National Music Camp, the Presbyterian Association of Musicians, and the Sewanee National Church Music Conference. Wilson is also organ curator of the recently restored Norton Memorial Organ (E. M. Skinner, 1931) in Severance Hall, and is house organist at Stan Hywet Hall and Gardens in Akron, where he plays the restored 1915 Aeolian organ. He has been heard in concert in many major cities throughout the United States, Europe, and Japan, including concerts at Symphony Hall (Birmingham, UK), Los Angeles’ Walt Disney Concert Hall, Chicago’s Orchestra Hall, Cleveland’s Severance Hall, Dallas’ Meyerson Symphony Center, and Uihlein Hall in Milwaukee. Wilson received his Bachelor and Master of Music degrees from the College-Conservatory of Music at the University of Cincinnati and completed further study at The Eastman School of Music. He has won numerous competitions, including the prestigious French Grand Prix de Chartres, the Fort Wayne Competition, the Strader National Scholarship Competition and the national competition sponsored by the First Congregational Church of Los Angeles.